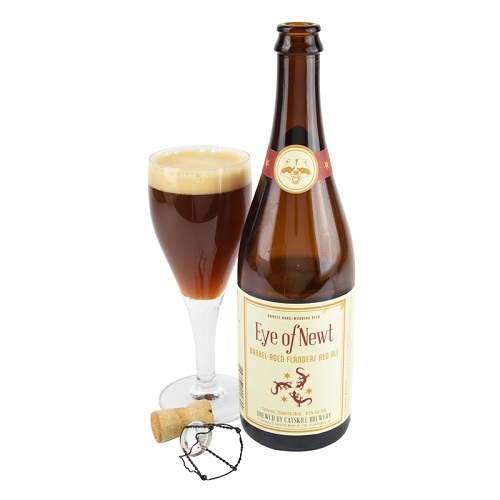 Eye of Newt includes Belgian and American malts as well as a special blend of wild yeasts and bacteria, and is aged in oak for around six months. Champagnelike package is distinctive. So is the beer, an almost completely opaque turbid amber pouring with a tremendous head that, alas, goes down even more quickly than it goes up. Tremendous nose hints of a first-class sour beer, in the style of lambic, full of fruit, acid, and barnyardlike flavors. Magic with crispy duck in cherry sauce, cooked carrots and fresh fruit. Better than many of its Belgian brothers. Pour sounds like music. Fred Eckhardt reminded us, “Listen to your beer.” Milky red haze and an uneventful surface gave me second thoughts, but the complex sensual assault hinted that this was something special. Spicy, herbal, cherrylike aromas tantalize. Flavor is highly acidic, i.e., sour. It takes me three sips to acclimate. Though there is an undercurrent of malt and fruitiness, acidity rules. Sour beer lovers will rejoice over the impact this Flanders Red Sour Ale orchestrates. Intense, assertive and complex.